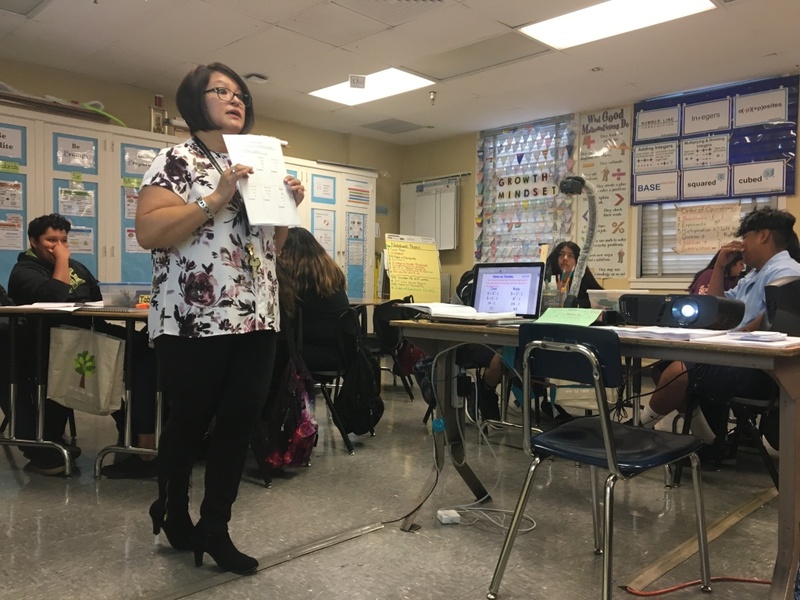 Hollenbeck Middle School teacher Patricia Garibay shows off a worksheet to her math class. After a school-wide shift away from lecturing, she delivers far fewer lectures to her class now than she has done in years past. Maria Ortiz's eighth graders are overthinking the problem. She can tell. She's pacing around the room, peering down at their algebra worksheets, recognizing how most of them are misunderstanding a core concept: that in a mathematical function, each input corresponds with exactly one output. Four years ago, Ortiz might've tried to correct them by stopping the class and talking them through the solution step by step. Not today. "These questions aren't meant to be tricky," are the only words she speaks to the class — at least at lecture volume. "They can have easy answers. Don't overthink them." Ortiz won't lecture out of this problem – not anymore. At the school where she works, Hollenbeck Middle School in Los Angeles' Boyle Heights neighborhood, teachers have another, newer plan to get these students to understand. 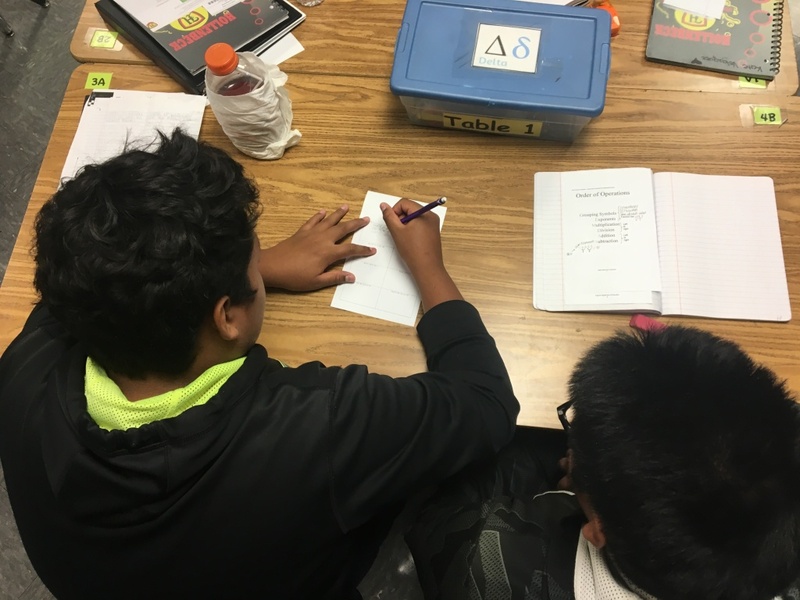 In recent years, Hollenbeck math teachers have reduced the amount of time they spend lecturing and drastically increasing the amount of times students spend working together in small groups. Instead of relying on teachers for step-by-step directions for solving each math problem, students rely more on their textbooks — and on each other — to learn concepts. Educators at Hollenbeck feel the shift is paying dividends in the school's standardized test scores. Two years ago, 16 percent of Hollenbeck students met or exceeded standards on California's benchmark math test — well short of the L.A. Unified School District average. This year, state test score numbers released Wednesday show roughly 30 percent of Hollenbeck students met or exceeded math standards — equaling the district's average. The increases make Hollenbeck's math scores some of the most-improved of any L.A. Unified middle school. Hollenbeck teachers see the rise in test scores and their shift to a "cooperative learning" model as intertwined. The middle school of 1,000 students shifted to the new model four years ago as California was debuting standardized tests based on the Common Core State Standards, a newly-crafted outline of the concepts and skills students are supposed to master by the end of each grade. The Common Core places a premium on understanding math at the conceptual level, rather than on simply repeating from memory the steps needed to complete a particular problem. That focus excites Hollenbeck principal Randy Romero, a former math teacher. "A lot of our teachers have really enjoyed teaching conceptually," says Romero. "But when Common Core came in, it really blew the doors open for them." The shift to a model that values student collaboration over teacher lectures pairs nicely with this central facet of the Common Core, forcing students to piece together their own conceptual understanding. "Teachers are giving students a real-life example," he adds, "and then students are struggling with the material to move from the real-life concept to an abstract formula." For instance, Ortiz hands her eighth graders a worksheet that compares a mathematical function to a vending machine. She wants students to understand that, in this analogy, the "input" is money. The "output" from a vending machine is a drink. As students struggle at first to grasp the concept, Ortiz patrols the room, gently guiding her students — all seated in clusters and working in groups — in the right direction. "Have you guys used a vending machine before?" she asks one group. "How does it work?" Slowly, the concept starts to click. Students at Hollenbeck Middle School work in partners on an assignment. Before the shift to the Common Core, Ortiz might've seated her students in rows and spent much of the class lecturing. Now, she estimates she spends around 10 percent of the class lecturing. It took time for Ortiz to adjust. "At first it was tough," she remembers, "because you’ve been taught by lecture. You went to elementary school — they lecture. You went to middle school, high school, to college and they lecture you." The hardest part of shifting to a cooperative learning model for Ortiz was giving up control over the noise level in her classroom — something that's easier to handle in a lecture setting. "I was worried that they were going to start having conversations that were not related to the topic," she says. "I had to learn to trust them that they were going to be having math conversation and it was going to be productive." But Hollenbeck teachers say the shift to cooperative learning allows students to focus on concepts that will be on the Common Core-aligned state tests — without over-emphasizing their importance. In the days of the now-retired California Standards Tests, veteran Hollenbeck teacher Patricia Garibay says the school stressed too much about exams. "It was pretty much practice, drill and kill," she recalls. Now, Garibay says, "most of the time, students focus on concept development." Brianna Ramirez, an eighth grader at Hollenbeck, says she's aware of the drawbacks of an instructional model based largely on group work. "Some people don’t contribute," she says, "and you’re the one doing all the work. "But most of the time," she adds, the group work "helps you a lot. You understand it better." Romero, the principal, is hopeful that other schools might be able to pull of a similar instructional shift Hollenbeck was able to execute — and that they, too, might be able to realize similar gains in their test scores. "Nothing that we've done here is particularly exotic," Romero says — Hollenbeck teachers has simply been open to learning a new method of teaching and has done so by working more closely with each other. Hollenbeck did, however, have help other schools don’t have: namely, extra support from the Partnership for L.A. Schools, a non-profit organization that operates 18 schools on behalf of L.A. Unified. The Partnership supplements the district's funding, spending an additional $675 per pupil — with 1,024 students at Hollenbeck, that's the equivalent of roughly $691,000 — on teacher trainings, staff retreats, restorative justice programming and parent supports. But all of those supports added up when the time came last spring for Brianna Ramirez to take the state's standardized tests. She remembers being nervous — the teachers had talked up the test, maybe a little too much. "Like they were stressing that on us the whole year," Ramirez says. "But when it came to the tests," she adds, "it seemed pretty easy. I guess the teachers prepared us well."